Malik denies the allegations, saying some are "complete fabrications"
LONDON, England (CNN) -- Britain's justice minister became the latest politician ensnared in an escalating parliamentary expenses scandal when he decided Friday to step down. 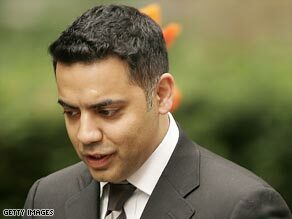 Shahid Malik says some of the allegations made by The Daily Telegraph are "complete fabrications." Shahid Malik will remain a member of Parliament but is stepping down from his justice minister role pending an inquiry into his controversial expense claims, the prime minister's office said. Malik, who represents the northern English city of Dewsbury, claimed the maximum allowable amount -- 66,000 pounds ($100,000) -- over three years for his second home in London, The Daily Telegraph newspaper reported Friday. That amounts to 443 pounds ($673) per week, the paper said. While Malik claimed tens of thousands for his London home, he paid below market rent for his home in his constituency, the paper reported. The 100 pounds ($151) per week also went to a landlord who was fined for renting out an "uninhabitable" house, the paper said. Malik defended his claims, saying he had done nothing wrong. His claims were within the allowable amount for members of parliament (MPs), he said, and involved nothing illegal or underhanded. "Nearly every MP in the country has claimed the exact amount that I have," Malik told CNN affiliate ITN. "And why's that? Because actually, a second home in London, to run it -- that's what it costs to run, approximately." Asked about the cheap rent he is paying in Dewsbury, Malik simply responded that some of the paper's allegations are "complete fabrications." Malik is considered a rising star within the ruling Labor Party. Elected to parliament four years ago, he has since held two top posts -- justice minister and, earlier, international development minister -- becoming the country's first Muslim minister. The expenses scandal has grown over the past week as The Telegraph, which has had access to details of lawmakers' claims, has printed them on the front page. Friday's headline about Malik took up the front page, from the masthead to the fold. What do you think about the expense scandal? The Labor Party cut ties Thursday with another top lawmaker, Elliot Morley, who admitted claiming more than $24,000 in interest payments for a mortgage he had already paid off. A party spokesman said Labor had suspended Morley, meaning he retains his parliamentary seat but is stripped of his party affiliation. While Morley filed claims for the mortgage costs, he rented his London home to fellow Labor lawmaker Ian Cawsey. Cawsey claimed his rent payments on his expenses, in what amounted to a "double dip" on public funds. Also Thursday, a senior aid to Conservative Party leader David Cameron resigned after revealing that he and his wife, who is also a member of parliament, had each claimed second home allowances on separate properties over eight or nine years. Cameron, who is the opposition leader, ordered eight of his senior parliament members to repay claims they had made for furniture and maintenance on their second homes, warning them they would lose their jobs otherwise. Health Minister Phil Hope paid back $60,000 in fittings and furniture claims after the Telegraph made them public, saying he could not stand "the blow to my integrity." Cynics suggested it was more likely the potential blow to his wafer-thin majority of 1,571 in his constituency that was worrying him ahead of a general election next year. Labor, Conservative and Liberal Democrat lawmakers also fear a backlash in local government and European parliament elections next month, which could benefit fringe parties like the United Kingdom Independence Party and the far-right British National Party.